Every UFC fan is now even more anxiously waiting for UFC 236, as it has been regarded as biggest fight of the year! This along with multiple other highly anticipated matches will delight fans. We do not want to miss any moment from UFC 236 at any cost. How to Watch Holloway vs Poirier Live Online? 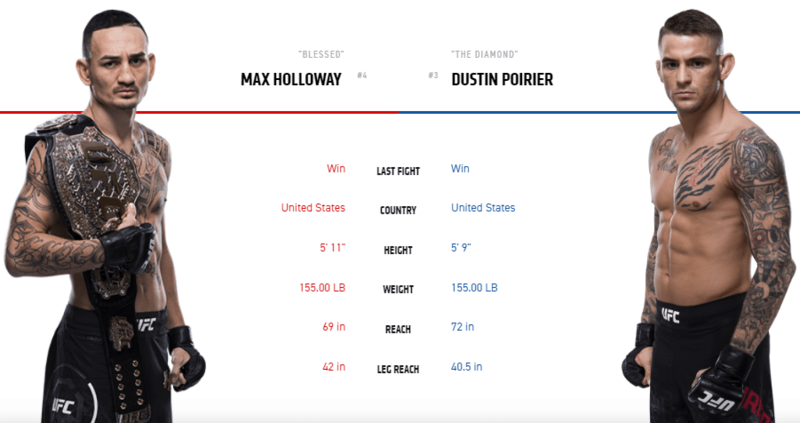 There are three ways to watch UFC 236 Main Event Fight Max Holloway vs Dustin Poirier live online form anywhere. Check them out and pick the solution most suitable for you. 1. How to Watch UFC 236 Online for Free? Download and install PureVPN on your preferred smart devices. Connect to PureVPN’s Russian server. Open the link https://matchtv.ru/on-air once UFC goes live. Livestream UFC 236 pay-per-view for free. 2. Where to Watch UFC 236 Online? Here’s the list of channels on which you can watch UFC live online. UFC.TV Pay-per-view varies for every fight and in every region. Here’s your chance to take advantage of our research and get the cheapest PPV. Note: The above price comparison is for UFC SD PPV. HD PPV is also available on slightly higher prices. 6 Months subscription plans are also available with discounts. Below is estimated times in different time zones when UFC 236 main title fight is expected to start between Holloway vs Poirier. Las Vegas (PT): 8 p.m.
Los Angeles (PT): 8 p.m.
Fox Sports is no longer an exclusive broadcaster for UFC events. Its long-time contract with UFC was recently dissolved, and UFC is now free to shop around for TV deals. Follow the steps below to watch UFC on Fox USA for free. Download and install PureVPN app for your preferred smart devices. Connect to the USA server. Open the Fox Sports 1 website and navigate to UFC event link to watch it live. UFC fans from around the world want to watch the action live online. Unfortunately, most international viewers won’t be able to catch the action live because of restrictions. But, there is an easy solution to this very frustrating problem. Connect to our Russian server. Live stream Holloway vs Poirier pay-per-view. What Devices Does PureVPN Support to Watch UFC 236? UFC officially supports many devices including gaming consoles and TV Set boxes. They have their apps on it or are available through different service providers. With PureVPN, you can access the UFC 236 live stream on those devices through simple steps. Install Planet MMA Add-on from Ares repository. Change location to UK or US. Enjoy live streaming UFC via Kodi. Connect to PureVPN’s server required by the channel you want to access. Open the browser and access channel’s website. Start live streaming live on PS4. Configure PureVPN on your Apple TV via router. Access the UFC fight through any of the above mentioned ways. Live stream UFC and enjoy the live moments. Open Xbox internet browser and visit www.matchtv.ru/on-air. Live stream UFC on Xbox and catch all the action live. Download and Install PureVPN app on Android. Connect to PureVPN’s US server. Visit Fox Sports and sign in. Danyal is Digital Marketing Strategist with interest in Content Marketing. He is a passionate researcher, learner, an avid reader and occasionally writes to spread knowledge and raise awareness for societal benefits. He loves sports, travelling and his family.